COPYRIGHT Music publishing, broadcasting In January 2013, Welsh language music ceased to be played on BBC Radio Cymru when the BBC lost the right to use the music in a row with Eos, the then newly formed collection society set up by the Welsh Music Publishers and Composers Alliance (Y Gynghrair) to represent Welsh sonqwriters and composers in the broadcast environment. 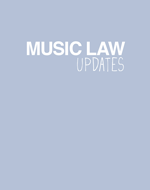 The WMPCA had said that changes to PRS for Music’s distribution policies meant that most Welsh language composers had “lost around 85% on average of their royalties” and Eos attracted 297 composers and 34 publishing companies as new members, who ‘opted out’ of PRS for Music, transferring the broadcast rights to some 30,000 works into Eos. Eos did reach agreement with S4C – Channel 4 in Wales before the end of December 2012. The Welsh music, previously core to the BBC’s Welsh services, went off air for just over a month, making it hard for the national broadcaster to meet Welsh language targets – and of course with Welsh music not being played on the radio in Wales, Eos’s songwriters and publishers were not getting paid either – and nor were the performers of the songs getting any ‘needletime’…. Prince has launched a $22 million lawsuit against bootleg sharers.